A TEAM of caring volunteers are banking on residents to support their neighbours in need – and the demand is expected to be high. Members of Knaphill Methodist Church are launching a clothes bank project for people who may not otherwise afford to buy new clothing and bedding. “Having identified the need for a clothes bank, we do hope the community will support us,’’ said church member Jane Ing, one of the founders of the clothes bank project. There are 834 families registered as underprivileged in the Knaphill, Brookwood and Pirbright areas. The clothes bank, which will work along similar lines to a food bank, follows an initiative set up in Weybridge where a huge hidden need for such a service was discovered. Jane, who is well aware of the potential demand for the new facility, added: “I was quite surprised to learn about the number of families living in cars, church gardens or doorways. That was quite frightening. “Having spoken to the homeless shelter manager in Woking, there is an immediate and urgent need jeans, trainers and sleeping bags as winter approach the need for jumpers and waterproof coats will increase. 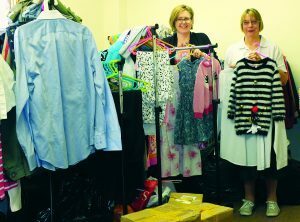 Organisers plan to partner with Sure Start centres and other organisations who refer their clients to the clothes bank. Callers will then be able to choose the clothes they need and have some food and a cup of tea. The clothes bank will be launched on Saturday 21 October and will run on the third Saturday of each month. It has already been inundated with donations but more are welcomed. People in need can collect a voucher for the clothes bank at: St John’s School Sure Start Centre; Woking Sure Start Centre, Sheerwater and Sythwood Children’s Centre; Brookwood and Pirbright Children’s Centre and Busy Bees Sure Start Centre. It is the largest outreach project Knaphill Methodist Church has undertaken to date.